Adirondack Basement Systems is an experienced contractor and trained PolyLevel dealer offering concrete Repair services in Albany, Schenectady, Troy, Saratoga Springs and beyond. Basement Systems of New York is Greater Hudson Valley's premier PolyLevel dealer offering the one-of-a-kind two-part expanding foam solution to concrete slab unevenness! Quality 1st Basements provides PolyLevel concrete leveling and lifting services in the Bronx, Brooklyn, Manhattan, Queens and Staten Island. Woodford Bros., Inc specializes in foundation repair and concrete lifting for homes and businesses throughout Central New York. They have nearly four decades of experience in the construction renovation industry and have been involved in over 30,000 projects. 21st Century Concrete Leveling is a concrete leveling company that specializes in PolyLevel to fix settling concrete slabs. 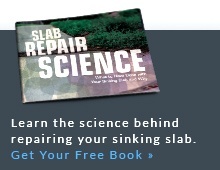 Stop letting sinking concrete slabs lower your property's image and value. With the stress-free concrete leveling system from The Foundation Solutions, they can guarantee restored steps, walkways, patios, and more! Schedule a free estimate in Edinboro, Erie, Warren, and areas nearby in PA and NY. Superior Concrete Services of Greater Buffalo, NY offers expert concrete repair solutions, including concrete leveling and concrete sealing. Call for a free estimate on their durable concrete repair solutions today in Buffalo, Orchard Park, Tonawanda and nearby. Conditions where outdoor concrete has already begun to sink is not uncommon in New York and is often the result of shifting or a weak soil base or erosion. It causes driveways, sidewalks, walkways, concrete steps or patio areas to become tripping hazards and can effect property value. New York, also known as The Empire State, hosts a variety of soil types, ranging in density and load-bearing capacities. From New York City to Upstate New York, the state terrain includes a wide range including urban areas, farms, forests, rivers, mountains and lakes. Today, select contractors in New York are trained and to provide a better alternative to mud jacking. PolyLevel is a less intrusive, lighter weight solution that doesn't add more weight to the problem. If you are seeing signs of sinking concrete on your property, have a contractor to provide the PolyLevel alternative to mud jacking take a look at it. 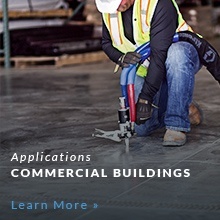 The following New York contractors are trained and to provide a free estimate to solve your sinking concrete problem. "Very nice job leveling our patio slab. Multiple cracks. So far it's kept..."
"Very impressed with the job done. John and Dave were great and took the..."
"Just a great job ... Amazing how Dave & Josh worked to get the..."
"Just wanted to let you know that we are very happy with the job your crew..."
"Very professional, good communication skills, and did an excellent job." "Ken, I wanted to give you some feedback on our leveling job last week..."
Ken, I wanted to give you some feedback on our leveling job last week. Simply, I am thrilled and astounded to have a 35 ft slab of concrete raised up to meet the garage floor. Bob and Jordan did a great job, they were pleasure to deal with, and all done for a reasonable price. You certainly have a recommendation from me and I have passed on this same information to (others). He tells me he has several situations that could use this fix. Thank you again. Jerry K.
"I just wanted to let you know that I am VERY pleased with the way my..."
Looking for an estimate on leveling some concrete around our in ground pool. We are interested in purchasing a home that needs foundation underpinning. I would like an estimate. Hi, have a driveway section maybe 8x8 that needs raising and I am interested in getting an estimate. I assume you would use the poly foam method, but let me know how I can get an estimated cost. Thanks. Leveling cool deck on pool. The concrete slab at the base of my front stoop has sank, creating a gap between it and the first step. I'm interested in the PolyLevel to raise it up. Thank you. I have roughly 1600 sq ft of concrete around my inground pool. Some of the slabs have sunk a few inches and I have one slab that has cracked in the middle. Looking to level out the sunken concrete and repair the cracked concrete. I'd like an estimate to lift my sunken concrete slab on my front walkway. The large concrete slabs at my pool area are uneven. Back half of 2-1/2 car garage is sinking and cracking. I have a patio slab that measures 5'x11'6" and is sloping about 3 degrees down away from the house. No cracking or anything like that. Just very noticeable when sitting out there. Need info on pool slab leveling and costs. I have a section in my garage that need to be leveled. I have one sunken concrete slab that needs to be raised. Perfectly intact slab, no issues just sunken down. Part of my garage floor has cracked and sunken. 27 year old concrete drive with cracks and settling. I have about 4 or 5 concrete slabs (4'x4') on my walkway that needs to be lifted and leveled. They are uneven now. Need an estimate cost of fixing them. I have a 24 by 20 garage behind my house. It was built around 1973 on a slab. Many years ago a crack developed down the center about 12 feet. I believe the left quarter of the slab has sunk a few inches. it has been stable like this for years. This has caused the garage to be slightly racked. Your poly level may be a good product to fix this. Qoute on leveling the concrete around my pool. Two car garage apron approx 26 x 2.5 has sunk 3-3 1/2 inches on one end. Slopes up to 0 sink at the opposite end (26') Need to either raise it back to meet garage floor elevation or skim top concrete before adding trench channel drain to control surface water. The walkway around my in ground pool is becoming undermined. I also have a covered patio that is sinking. Comment: Looking for an estimate on leveling some concrete around our in ground pool. Comment: We are interested in purchasing a home that needs foundation underpinning. I would like an estimate. Comment: Hi, have a driveway section maybe 8x8 that needs raising and I am interested in getting an estimate. I assume you would use the poly foam method, but let me know how I can get an estimated cost. Thanks. Comment: Leveling cool deck on pool. Comment: The concrete slab at the base of my front stoop has sank, creating a gap between it and the first step. I'm interested in the PolyLevel to raise it up. Thank you. Comment: I have roughly 1600 sq ft of concrete around my inground pool. Some of the slabs have sunk a few inches and I have one slab that has cracked in the middle. Looking to level out the sunken concrete and repair the cracked concrete. Comment: I'd like an estimate to lift my sunken concrete slab on my front walkway. Comment: The large concrete slabs at my pool area are uneven. Comment: Back half of 2-1/2 car garage is sinking and cracking. Comment: I have a patio slab that measures 5'x11'6" and is sloping about 3 degrees down away from the house. No cracking or anything like that. Just very noticeable when sitting out there.